For Austin, inspiration can stem from anywhere. The clouds of the sky, the waves of the sea, and lilies in a field. The wings of a dove, or the miraculous tracings of a spider’s web. The flowing draperies of the ancients, gorgeous silks of the east, the refined frivolity of the 18th century to the glamour of the silver screen. The process of draping starts when Austin develops his design from a vision in his mind into a three dimensional reality, and it is one of his favorite phases of the design process. Working with muslin and pins on a dressmaker’s mannequin, a wearable sculpture comes to life. An outline of a dress' particular silhouette is established and built up accordingly. If a design involves volume, or a has an outline that stands away from the body, each layer of the dress in engineered one by one until the desired effect is achieved. Any internal structure must be decided on and shaped to perfection. 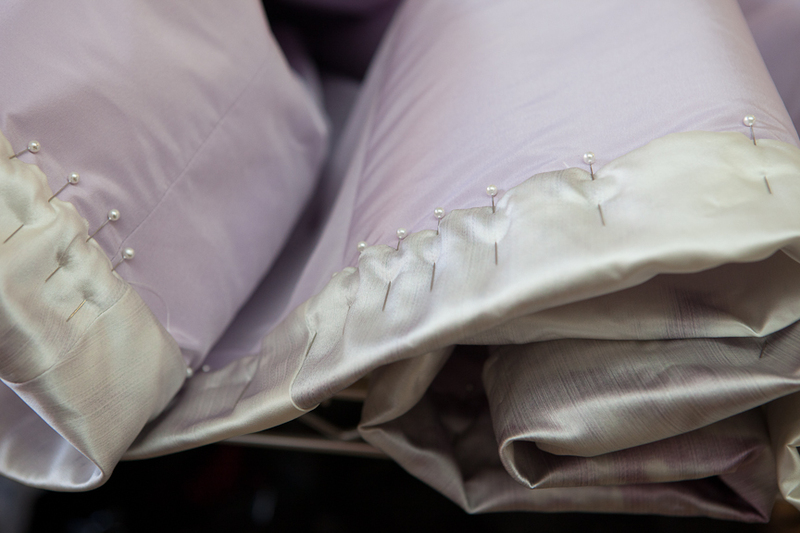 Each pleat and fold is formed by Austin’s hand, every flounce placed with the utmost sensitivity. Proportions are refined and each design is worked and reworked with the goal of creating the most beautiful, flattering, and perfect dress possible. Rich, supple satins, sculptural silk failles and mikados, crisp taffetas, flowing chiffons, floating organzas and ethereal tulle illusions each have their distinct characteristics and their unique beauty is brought to life in the collection. Austin chooses the finest and most beautiful materials from around the world to use in making his creations. The glamorous shimmer of beadwork, trembling fragility of a hand shaped silk blossom, dramatic gesture of a sculptured bow, or sheer romance of an appliquéd lace frill, every detail give each dress its own unique personality. As with every detail, all embellishments are painstakingly executed by hand. Hand painting on silk, or creating his own fabric of individually cut petals, Austin’s love of combining age-old techniques with an artist creativity can be seen in every aspect of his gowns. The sewing of Austin’s dresses begins only once every detail has been fine tuned. Every gown is made to order, one by one, just for you. Strapless dresses each include a built in corset or bustier, where each and every curve of the wearers figure is molded to create a flattering, streamlined contour and feeling of embracing support that can only be achieved through a meticulously structured foundation. Inside and out, Austin's designs display the beauty and technical perfection that is the art of couture.